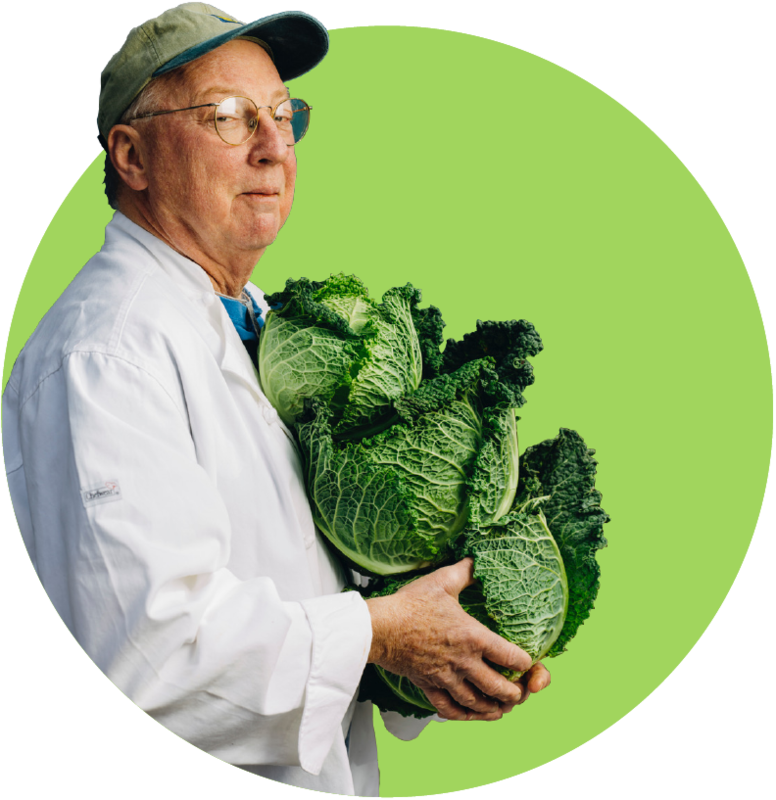 On July 22, 1999, in Birmingham, Alabama, author and activist John Egerton convened a two-day meeting of 50 people who lent their names to a non-profit organization dedicated to the documentation and celebration of the diverse food cultures of the American South. Three-fifths of the founding members attended the organizational meeting wherein a mission was set and a name adopted. That night, the founders gathered for a celebratory dinner of butterbean crostini and rabbit pilau at Highlands Bar and Grill, Pardis and Frank Stitt’s Birmingham restaurant. 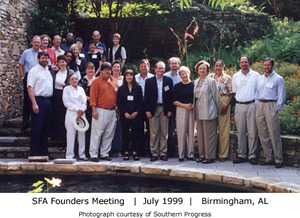 Two organizations with similar aims preceded the SFA: The Society for the Preservation and Revitalization of Southern Food, spearheaded by Edna Lewis and Scott Peacock, and the American Southern Food Institute, led by, among others, Jeanne Voltz. Soon after the SFA was established, both organizations folded their member rolls and cash reserves into the SFA. At that July of 1999 meeting, the founders elected a board of directors and agreed to hire John T Edge as director of the SFA. He remained the sole employee until Mary Beth Lasseter was hired as associate director in 2004. In 2005, Amy Evans Streeter became our oral historian. Soon after, Joe York, who like Edge, Lasseter and Evans, is a graduate of the master’s program in Southern Studies, came on board as our film maker. In 2007, Melissa Booth Hall signed on as our third employee. As the SFA has grown, we have honed a mission that leverages oral history and film work through publications and programming. We have also hired more staff and made a greater effort to reach larger audiences. As you know, a new effort is emerging to establish an organization that would bring together people from all over the region and beyond who grow, process, prepare, write about, study, or organize around the distinctive foods of the South. The principal base for this comprehensive and inclusive group will be in the Center for the Study of Southern Culture at the University of Mississippi in Oxford. They are offering us an opportunity to use their tax-exempt, non-profit status and their support staff like a greenhouse to grow this new organization, which will have its own officers and board, a self-generated budget, and an independent mission: to preserve and enhance the great food heritage of the South. To get the pot boiling, I’ve been asked to send this letter of invitation to 50 people whose interest in such an organization is widely known. We request the honor of your participation in a “founders’ meeting” at Southern Living magazine on Thursday, July 22. We will meet all day and then adjourn to Highlands Bar & Grill, where Chef Frank Stitt and his wife Pardis will be our hosts for drinks and dinner. From 9 until noon the next morning, we’ll gather again at Southern Living to complete our work. You will appreciate, I’m sure, the spirit of inclusiveness that is driving this effort. The time has come for all of us–traditional and nouvelle cooks and diners, up-scale and down-home devotees, meat-eaters and vegetarians, drinkers and abstainers, growers and processors, scholars and foodlorists, gourmands and the health-conscious, women and men, blacks and whites and other identity groups, one and all–to sit down and break bread together around one great Southern table. We all know that this is the finest regional food in America, yesterday and today and forever. Here is our chance to keep it vibrant and to share it with one another and the rest of the world. We sincerely hope you’ll agree to come to Birmingham and help us. Please click here to read oral histories with the founding members of the SFA.